Advanced repair techniques are constantly under review to achieve incremental improvements. The first step in preparing the injury is to expose the damaged area so that we can assess whether or not the tyre can be repaired. This is an example of how we prepare a bead wrap. We do not disturb the bead bundle at any stage of this process. Once the window is completed we then apply the wires over the window and up around the bead to replace the turn up ply in the tyre. The repair is cleaned and then painted with a solution. The solution is allowed to dry. The repair is then filled with raw rubber using extruder guns. Tytec prides itself on our finished product. 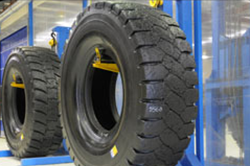 We believe that our finished product should be presented like a new tyre.